Nguyen-Viet, H. and Pham-Duc, P. 2019. Wastewater reuse in agriculture and health in Vietnam. In: J.B. Rose and B. Jiménez-Cisneros, (eds) Global Water Pathogen Project. http://www.waterpathogens.org (S. Petterson and G. Medema (eds) Part 5 Case Studies) http://www.waterpathogens.org/book/wastewater-reuse-in-agriculture-and-health-risk-in-vietnam Michigan State University, E. Lansing, MI, UNESCO. The study provides a framework to estimate the health risk of farmers using wastewater in agriculture. The study addresses the SDG 6.3: to contribute to inform water recycling and reuse. Exposure to wastewater via contact with Nhue River water, pond water and composted excreta represents an important health risk. Study results are useful in developing an integrated strategy for risk management in the agricultural settings. 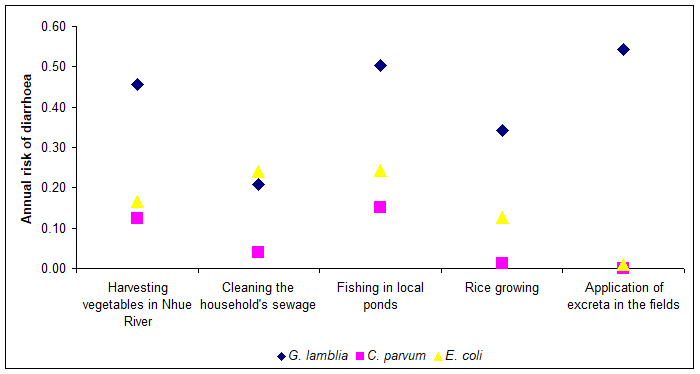 The objective of this case study was to predict the risk of diarrhea related to the use of wastewater and excreta in an agricultural community in Vietnam. We aimed to assess the risk, and to recommed how farmers can reduce the risk when using wastewater and hence to promote the safe use of wastewater. In Vietnam, the reuse of wastewater and human excreta for agriculture is popular. Due to poor treatment of wastewater and excreta before use, health risk posed by reuse activities might be important. This study was conducted in Ha Nam province where wastewater come from Hanoi city to the Nhue river and from locally generated from agriculture and household activities. Local people use thise wastewater for agricultural activities. The study was carried out in two communities of 26,000 people for 4,200 household in Ha Nam Province. The economic basis of these communities relies on both livestock and crops. The residential areas are in the vicinity of fields used for rice cultivation, vegetable planting, and fish breeding. The rice fields and local ponds cover about 50% of the surface. Most of the households have decentrilised sanitation system (septic tank, double vault latrines) to treat human and animal waste, which is reused for agriculture as fertiliser. Wastewater both from Hanoi and Ha Nam is used for irrigation. While the wastewater reuse provides many benefits, it might cause health risks for people. The highest load of diarrhegenic E. coli (DEC) (6.4 x 108 MPN/100 ml) and C. parvum (6 oocysts/100 ml) was in household sewage; whereas G. lamblia was highest in composted excreta (120 cysts/gram). The most hazardous exposures included direct contact with the Nhue River and pond water and composted excreta during field work. Exposure to wastewater represents an important health risk, in particular for rice production. Risk mitigation should focus on exposure reduction including raising the awareness of farmers and the use of personal protection equipment. The use of excreta in both agriculture and aquaculture has been practised for centuries in Asia, in particular, in China and Vietnam. Wastewater and excreta reuse provides many benefits for agricultural users such as reliable water resources, valuable nutrients, increased productivity and reduction in inorganic fertilisaers, however these practises may pose potential health risks (van der Hoek et al., 2002; Raschid-Sally et al. 2005). The study was carried out in Nhat Tan and Hoang Tay Communes, King Bang district, Ha Nam province, Northern Vietnam, situated about 60km south of Hanoi (see Figure 1). Ha Nam is located at the Red River Delta with a climate characterized by a tropical monsoon. Nhat Tan and Hoang Tay communes have populations of 10,500 (2,708 households) and 5,678 (1,574 households), respectively. Most households raise livestock in their compounds. The residential areas are in the vicinity of fields used for rice cultivation, vegetable planting and fish breeding. Hoang Tay commune boarders the Nhue River and the Nhat Tan commune is connected with Nhue River through a pump station and canal system. Figure 1. Map of the study sites in Hoang Tay and Nhat Tan communes, Ha Nam provice, northern Vietnam. Nhue River receives Hanoi's wastewater originating from households, industry, and other sources such as hospitals, without any treatment. The Nhue River water is used for crop irrigation and to feed fish ponds. Several pumping stations are located along the river and a system of open and closed canals distribute the water to fields and fish ponds. Wastewater from households (grey water from kitchens and bathrooms, and effluent from spetic tanks and sanitation facilities) is directly discharged into the small irrigation canal. The area has two main rice production cycles per year. In general, uncomposted or partially composted human and animal excreta are used as fertiliser. Personal protective measure to prevent contamination are often lacking. The objective of this study was to assess the microbial infection risk for diarrhoeal diseases related to the use of wastewater and excreta in agriculture by Quantitative Microbial Risk Assessment (QMRA). We aimed to identify the major exposure points for disease transmission as places for public health control interventions in agricultural settings where wastewater and excreta are intensively used as irrigation water sources and fertilizers. Hazard identification: Three reference pathogens were selected for this study: Escherichia coli O157:H7; Giardia lamblia, and Cryptosporidium parvum. All of these pathogens have caused waterborne disease and are important pathogens in Vietnam. Exposure pathways:Five exposure points were modelled in the assessment for accidental ingestion of Nhue River water when harvesting vegetables, involuntary ingestion of sewage when cleaning the household sewerage system, involuntary ingestion of local pond water while fishing, accidental ingestion of irrigation water used for rice; and involuntary ingestion of composted excreta when fertilising fields. Exposures: A field survey was carried out from April to August 2009 in Hoang Tay and Nhat Tan communes. There were 235 adults (male and femail) ranging from 16 to 65 in age, randomly selected from the household list provided by the Communal People's Committee. A structured questionnaire was used to obtain information to assess people's exposure to the Nhue River water, local ponds, and irrigation water, as well as exposure to human and animal excreta at home and in the fields. The magnitude and frequency of exposure for each modelled event is summarised in Table 2. The assumptions applied in the health etffects assessment are summarised in Table 3. The annual risk of infection was calculated for each scenario, and is summarised by pathogen and exposure in Figure 2. The assessment indicated that risks are unacceptably high for G. lamblia, C. parvum and diarrhegenic E. coli infections among people exposed to wastewater and excreta. Study results are useful in developing an integrated strategy for pathogen management and public health control measures in the agricultural settings where wastewater and excreta are intensively used as irrigation water sources and fertilisers; and where household wastewater is freely discharged into irrigation systems. and Y., andMatsuno (2002). Urban wastewater: A valuable resource for agriculture - A case study from Haroonabad. Haas, C.N and Rose, J.B (1996). Distribution of Cryptosporidium oocysts in a water supply. Water Research. 30, pp. 2251-2254. Haas, C.N, Rose, J.B and Gerba, C.P (1999). Quantitative Microbial Risk Assessment. New Yorkpp. 449. Howard, G., Pedley, S. and Tibatemwa, S. (2006). Quantitative microbial risk assessment to estimate health risks attributable to water supply: can the technique be applied in developing countries with limited data?. J Water Health. 4, pp. 49-65. L., CRMRasc and S., B (2005). Managing wastewater agriculture to improve livelihoods and environmental quality in poor countries. Irrigation and Drainage. 54, pp. 11-22. Rose, J.B, Haas, C.N and Regli, S. (1991). Risk assessment and control of waterborne giardiasis. American Journal of Public Health. 81, pp. 709-713.